That word is segmentation. In my previous post I highlighted the various sources of intelligence achievable through social media analytics and possible ways to measure them. Here I take a step back and discuss how those sources of intelligence are obtained through the careful segmentation of social media data. Below are some of the sources of intelligence that were addressed previously but segmented by business function to accomplish varying business needs. Segmenting social media data will allow you to slice and dice information to enable greater insight for multiple stakeholders. It can therefore accommodate for different time and response needs – crisis management for marketing, to trend analysis for business intelligence. Please note that they are very much interchangeable – sentiment data could easily be used for product development, marketing or business intelligence. Similarly competitor research could aid sales as well as marketing and so on. As always feel free to feedback additional areas that you think of or already use. 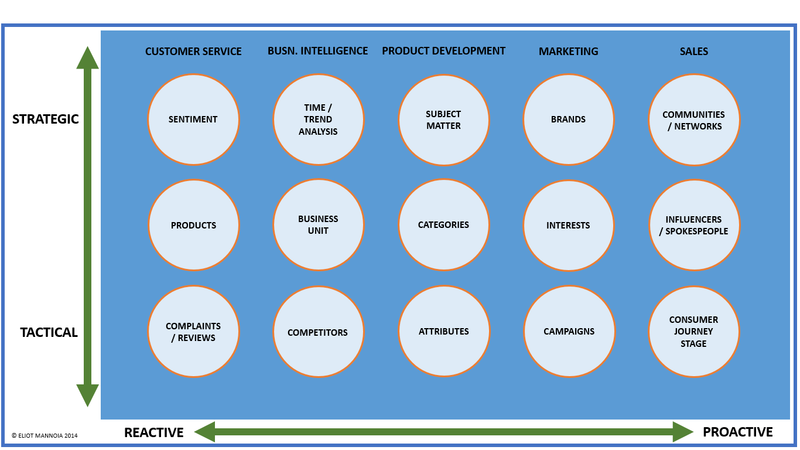 Below is a model that visualises where each of the above segmentation options could sit across different business functions. It also indicates which data sets could assist the longer-term strategic planning of a business, versus providing short-term tactical intelligence. Competitor research, for example, could sit under tactical as a business is not usually privy to another organisations longer-term business plan. Here Samsung could employ real-time marketing to react to an announcement Apple made. However, competitor data could equally sit under strategic if the data is used to map out longer-term increases of share of voice. In fact competitor data could also come under customer service, product development, marketing and sales. The model illustrates a natural place for certain data to sit, but as with all models it is merely a possible reflection of reality. An additional dimension is added along the x-axis to show which functions and corresponding data sets tend to be more reactive as opposed to proactive. As with campaigns and measurement always consider the wider business objectives before you embark on a segmentation adventure. Determine how that social media data is going to be transferred to other business functions in the form of actionable insight – it needs to answer the question “so what”? Lastly, seek to uncover unanticipated intelligence that can drive change, innovation and make the most of opportunities. For a great real life case study Kevin Ashton’s piece is a must read, in his post he perfectly highlights his use of social media data to develop products. UM Wave is also worth a look as they have taken segmentation globally and offer great insight which you can freely interrogate. For the true data scientists out there, you can visualise various social graphs by using a fantastic open-source package called Gephi. How do you currently segment your social media data? Really insightful piece here Eliot, however I feel that the competitor analysis for Tesco is limited to the obvious direct competitors (i.e. the other supermarkets). How would you analyse competitors that are less obvious but are still taking market share? An example could be looking at the camera industry. Canon’s traditional competitors are Nikon, Olympus etc. and have recently seen threats from Panasonic and Sony with their mirrorless cameras. However, how would you measure the share of the market that is being taken by the smartphone manufacturers? In my opinion Canon isn’t competing with Nikon any more, they are competing with Apple. Hi Edward, thanks for your feedback. You’re absolutely right, with the advance of technology the possibility of disruption to an existing industry is always just an app away. Uber and the taxi industry being a great case in point. So when you’re looking to gather some business intelligence, share of voice, mystery shopping etc., you do need to consider all possible competitors. The above is just a simplified example. Then it’s a question of including them in your research in a similar fashion as done above. So for your example you would look for all mentions of Apple, iPad, iPhone in connection with camera(s) and picture(s) (lists not exhaustive). You could then look to get a share of voice across all competitors, and for more insight, dive into the actual conversations to determine which product attributes consumers love most. The potential is endless. Holy cow! So much to ponder. I really like the idea of having wider business objectives yet looking for your unexpected niche. I think that’s just the right combo. Thank you!